Is there a better alternative to Bean's Quest? Is Bean's Quest really the best app in Adventure category? Will Bean's Quest work good on macOS 10.13.4? 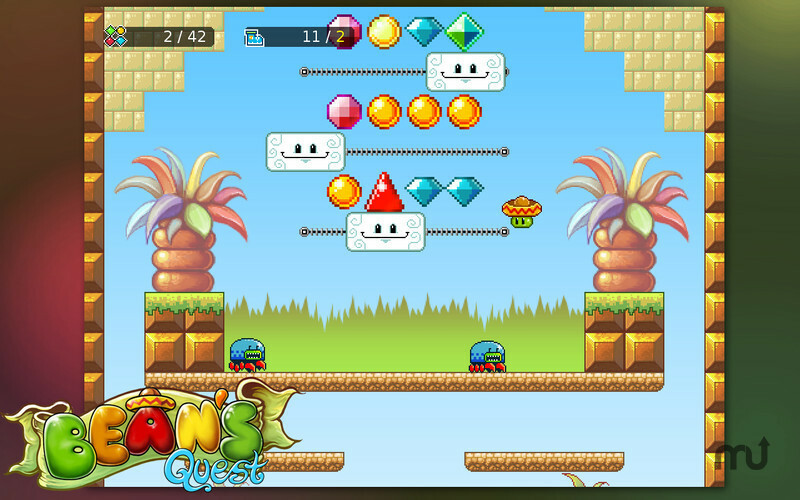 Bean's Quest (was Bean's Quest Final) offers dive worlds to explore with three achievements per stage! Bean is easy to pick up yet hard to master! Five unique worlds to conquer! Over 150 challenges to complete. Incredible soundtrack with over 10 original pieces of music! Emilio has been cursed and his girlfriend kidnapped! Transformed by dark magic into a jumping bean, you must bounce your way to victory through 50 levels spread over 5 worlds. Can you rescue your one true love and find your missing pet axolotls? Bean's Quest needs a review. Be the first to review this app and get the discussion started! Bean's Quest needs a rating. Be the first to rate this app and get the discussion started! Bean's Quest brings back retro platforming to your Mac with super intuitive controls; move left or move right - it's so simple! Beautiful 16-bit stylised artwork fills every stage; shimmering diamonds, sparkling special effects and subtle parallax culminate in a mesmerising view! Each world has a unique soundtrack by acclaimed composer Flashygoodness. Push blocks, spin seesaws, roll boulders, crush enemies and dodge spike-balls! Classic platforming blended with physics puzzles and adorable creatures. Every stage is jam packed with jewels to collect. A guy's gotta surprise his girl when he rescues her, right? The evil wizard who cursed you also kidnapped your pet axolotls - brutal! There's one hidden in every stage, track them down if you can! Every stage has a perfect jump count. Make it to the end fast enough and you'll earn the perfect jump badge!